The Wall Street Journal reports MTV's VH1 will, on January 13, launch "Web Junk 20," a show featuring video clips found on MTV-owned iFilm. MTV hopes the show will drive viewers to the company's online channel, Vspot. Unfortunately, as with other MTV online efforts, Vspot does not work with Firefox and visitors using that browser are met with "We're Sorry. PC Users with Netscape, Mozilla or Firefox: you need to run Internet Explorer to use VSpot." Idiots. Those most likely to be interested in Vspot content have a clue and those who have a clue use Forefox, not IE. Please get a clue, MTV and screw your deal with Microsoft. Sprite, along with the Jun Group, has launched Marcus Hates His Job, a series of three short films that follow the life of a guy starting an internship that doesn't go a smoothly as he would like. Firts, he gets hired by someone who, upon his first day of work, does not work at the company any longer. His interaction with the boss is not encouraging. His visit with the IT department to get an email address where he is met by a paranoid IT guy who demonstrates the usual office administration insanity we all have to go through from time to time. The whole thing, while supposedly promoting Sprite, just gave us a stomach ache reliving our own early days in advertising struggling to get a nut. While we'd love to say it's all just another online video bandwagon jump emanating from a "Dude, we gotta do online video" creative jam session between iPod-carrying, file-sharing junkies, we can't. We actually like it. We're told Samsung Mobile has launched AnyFilms.net a site, created and implemented by Margeotes Fertitta Powell and The Barbarian Group, which features serial and interactive videos under the auspices of Ubiquitous Films and exec produced by Broken Flowers and Alexander producer Jon Kilik to highlight the cell phone as a rising video medium. The first serial film section of the site features two films. The first film Across the Hall has been directed by Alex Merkin, starring Entourage actor Adrian Grenier while another, "GiGi" was directed by Mark Dippe, the director of the feature film Spawn. Across the Hall was engaging enough to keep us watching until the end. The second section of the site is really interesting and provides six icons that can be dragged into different sections of a grid which then reveals portions of previously shot footage, featuring ten characters and a mysterious suitcase, that make up a mystery. The mystery can be solved by sliding the six icons into enough different positions on the grid enough times producing enough different footage to offer clues. We spent a good amount of time with it but didn't want to go through all 11,000 permutations and combinations. Suffice to say, it kept us wanting more. The site officially launches December, 24 but is live now. While the site purports to be all about dowloadable video, oddly, there seems to be no obvious means to download any of the content. No matter. We'd rather watch it comfortably at home rather than hunched over a cell phone fighting off angry commuters on the MTA. Oh wait. They're on strike. The site is being seeded and promoted across weblogs by HyperHappen, an agency whose website, in a stamp of approval of the medium, is a weblog itself. 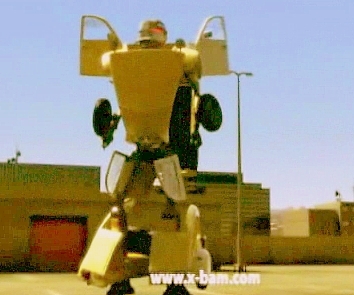 Eatmail.tv's Emily has put together the top five video clips of 2005 which include the Citroen C4 spoof, the Nut Bra, the Guinness Good Things Come to Those Who Wait ad, the Bill For First Lady political ad and Axe Deoderant's Ravenstoke Alaska news clip. Financial services company has launched a truly interesting site, called Your Point of View, that intends to become a clearing house for world opinion and a celebration f differences in a world of sameness. Oops, that sounded like a press release. Sorry, but that's really what it's all about. The site lets you voice your opinion and drill down into the opinions of different cultures on the same topic. From cloning, to haute couture to wind farms to tattoos and modern art, the site present metrics for each category. While it's all tied to HBSC, it's nicely detached from any obvious product promotion except, of course, for its brilliant method of collecting varying cultural insight for use in defining the company's country-specific marketing. That's just so not the way to thrust readers into a Slate story about what gifts not to give. Or, maybe it is. 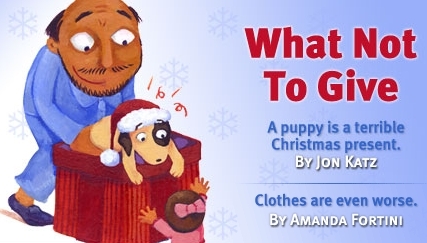 After all, doing that to a puppy isn't exactly a nice gift to give now is it? Especially when your kid is watching. Courtesy Gawker. Late last Thursday night, Time-Warner reached an agreement with Google whereby the search giant to soon rule the world would pay $1 billion for a five percent stake in AOL. The deal is a blow to, dare we say, old school, Microsoft which had, for a long time, been in talks with AOL regarding a content deal that would have involved Time-Warner's print, television and online properties and Microsoft's search and ad operations. The deal was sealed during the Time Warner Christmas party with Microsoft's execs in one conference room, Google's in another and Time-Warner execs running between the two. Florida-based company KOTW has announced a new product that allows for the delivery of video via email and which embeds the video within the body of the email rather than as an attachment. The new service will also provide metrics to advertisers such as number of views, length of views and who did the viewing. There's just one problem. It uses ActiveX which, if a personal firewall such as Norton is in place renders the thing useless and, counter productively, results in the need for a traditional video download or trip to a webpage where the video can be viewed. NOTE: In Comments, Michael Murray of KOTW clarifies some misconceptions we had about the product and offers a more detailed explanation of what the technology can do. 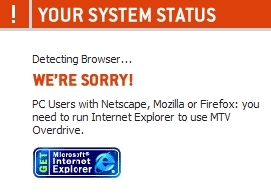 "PC Users with Netscape, Mozilla or Firefox: you need to run Internet Explorer to use MTV Overdrive," so says MTV's Broadband Video Channel site. Excuse us, MTV, but no, we don't. Perhaps you haven't heard that Firefox isn't just this little side project that a bunch of geeks work on in their spare time in-between discussing episodes of Battlestar Galactica. It's a full fledged, far superior to Internet Explorer, browser that's gaining some serious market share. Marketers who continue to practice this loyal-to-Microsoft buffoonery are unsmart, unintelligent and losing out on a vast chunk of business.